The Taurus X series, powered bynew Pivex cutting technology, provides an ideal balance betweencost and performance. The Pivexknife head cuts automotive interiorparts from leather faster and moreaccurately than any other automat-ed cutting solution on the market. The Taurus X series is available intwo table configurations. The TaurusXM offers the smallest footprint forflexible facility planning. 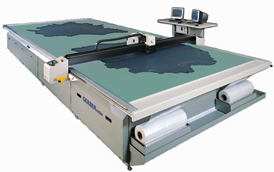 As yourbusiness grows, simply add anothersingle-station cutting system. TaurusXM provides a favorable return oninvestment, even at low-volumeproduction levels. The Taurus XDtwo-station system offers maximumproduction output with the highestreturn on investment in the industry. Choose from a complete line of automated leather cuttingsystems to maximize hide yield and throughput. Maximize leather yield using the industry's most powerful automatic nestingsoftware. Identify up to four different flaw grades for optimal hide usage. The Taurus cuts with zero buffer between parts reducing leather waste generated when using dies. Maximize hide utilization with flexible, electronic tool sets rather than hardtools. Eliminate the expense and wait times associated with the manufacture of diesand templates during program startup and in response to engineering changes. mEliminate the need forhigher cost, skilled leather cutters. Pivex knife technology cuts more leather faster. Cut up to 8 hides per hourwith Taurus XD dual-station system, and up to 4.5 hides per hour withTaurus XM single-station system (using fewer than 2 operators per system). Automated cutting eliminates the handling of heavy die tools, thereby reducing fatigue and improving worker safety. Achieve quality and accuracy of cut parts. Pivex knife minimizes or eliminates over cuts and heel cuts on most parts todeliver the best quality available from an automated cutting system. The reciprocating action of the Pivex knife, combined with the high frictiontable surface, minimizes hide movement to ensureparts arecut precisely. Pivex knife technology enables you to cut more notches and more notchshapes without sacrificing cutting speed. Cut custom notch shapes, includingmany internal and external slit, V, U and castle notches. Maximize cut part quality with CutWorks' automatic nesting features thatensure critical parts are cut only from the highest quality areas of the hide. Nest perforated leather or leather with multiple stretch directions. Gain control of your leather cutting process. Comparethe information furnished by leather suppliers to the actual hidearea scanned by Taurus to validate hide area for every hide. Digitally recordeveryhide, including critical data such as hide area, hideshape, and defects. Automatically transfer orders from your enterprise-wide system to theCutWorks database to schedule production. Use data from Taurus to accurately plan production for cut-to-order to mini-mize inventory on hand.